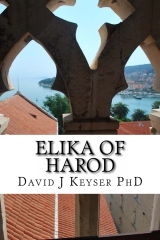 Elika Of Harod was one of King David's Mighty Men. He is listed as one of the Mighty in the Biblical book of II Samuel. However, in the book of I Chronicles, which was compiled later, he is omitted. Did he fall from favor with the young king? This is a mystery. I, Elika of Harod, joined David Ben Jesse in the hills of Ziph when the second group went out to him. I did not go with the first 400 because, at that time, I thought them to be rascals. I went with the 200, we thought we were better, but he soon taught us otherwise. I was with him as he fled from King Saul. I stayed with him in the wilderness. I was there when he began to reign over Judah at Hebron. I was there seven and a half years later when all Israel came to make him King over them; what a glorious day that was. I went out with him during Absalom's rebellion and returned with him after the boy was killed. I stood with Nathan the prophet and the warriors when Adonijah tried for the throne and that with my Lord David on his deathbed; I stood although my joints cried out with pain as I got from my own bed to stand the last time for his will. Now Solomon reigns and I am old. He does not favor me; I shall probably be forgotten. I record here my personal remembrances of this great King and soul. I also record some instances concerning others who surrounded us. I do not bring hearsay to these pages. I set down as fact only those things told to me by trustworthy witnesses; such as Sarah, the wife of my youth, the lady Abigail and a few of my fellow warriors. Much information came to me, 1 pass on only a portion. However, the reader will probably view this largely as the scribal wanderings of a tired old man. Perhaps I have become a frustrated cleric in my dotage. Adino was the first to start referring to David as the King. I suppose that many of us had this thought and desire for some time. We did not understand why Samuel did not do more to establish David as the King of Israel. Was he not the King maker? the prophet of the most High God? Adino and Eleazar and Benaiah had come with the first four hundred. Some said that they were the first after David's family to come or even that they came with Shammah and his other brothers at the very beginning. Adino was dark and swarthy; taller than most but not as tall as Saul. He was, I would say, a whole head taller than David himself. He was thickly built and powerful and carried himself with a great confidence. It was rumored that he did not come after David because he was in debt or beleaguered by King Saul. He came, it was said, from a satisfied and stable situation with the simple and true desire to make David King over Israel. No one knew how he first heard of David or what occasioned his joining him. Adino did not often share his thoughts with any man. Adino approached battle as farmer approached his fields or a vine dresser approached his vineyard. He merely strapped on his armor, picked up his weapon and departed for battle as a man leaves for work. Usually he would use a sword, sometimes a broad spear or even a battle ax, there seemed to be no reasoning as to why he picked the weapon that he did. But whichever weapon, it always was most effective against the enemy. One reason that Adino was always so effective in battle was because he always slept well the night before the battle. Many of us would do well if we were taken by surprise and had to fight. But if we knew that we might die in the morning, most of us did not sleep at all. Such was not the case with Adino. It was as if he knew; knew that he would live, knew that he would be victorious, and knew that David would be King. It always seemed to me that in Adino's mind David was already King. It was at a captain's meeting when we were fugitives from King Saul that I first heard Adino say it. Most of us were advising an early frontal attack on the Philistines, but David could not hear it. Tempers began to rise but no one wanted to openly defy David. I remember David leaning back in his camp chair and looking at all of us. Adino rose slowly, purposefully. "Very well, my King. We do it your way," he said. David did not move. Not even his eyes moved. It seemed that he stopped breathing for an instant. Everyone was very silent. Then Eleazar stood, then Shammah, Joab, Abishai, then others including myself until we all stood. It was very peaceful in the camp. David finally leaned forward over the sheep skin map before him on the small table and pointing to a hill and wadi with his dagger gave his strategy. Then followed questions, answers, agreement.